Twenty five miles outside Edinburgh, often referred to as ‘the Athens of the North’ is its counterpoint, Little Sparta. On Sunday my eldest daughter, her partner and I took a trip out into the Pentland Hills to visit. 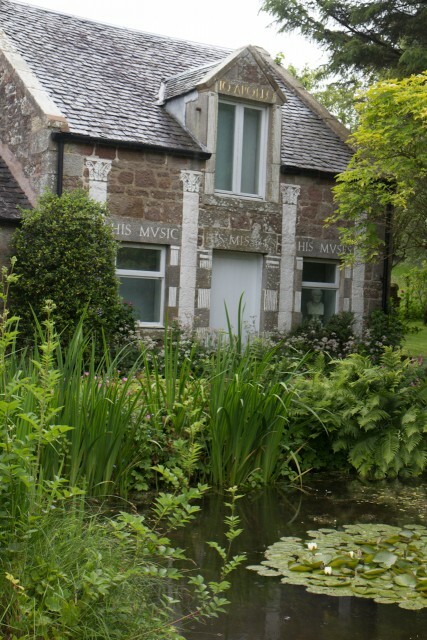 Little Sparta is the garden of the artist and poet Ian Hamilton Finlay. Described by Sir Roy Strong as ‘.. one of the few made post 1945 which must not be lost. It remains to me still the only really original garden made in this country since that date.’ Strong words. And a visit much anticipated because being remote and in a fragile landscape, it is both hard to reach and rarely open. The stars aligned though and we set off in a car club car (thank goodness for such a civilised mode of transport) through the Edinburgh suburbs and soon into the hills of South Lanarkshire. The walk from the tiny car park isn’t short, but its well worthwhile. The weather wasn’t kind – it drizzled the entire time, and the sun was nowhere to be seen, but it felt appropriate to the landscape which is hardly redolent of Greece. The weather kept visitors to minimum and the size of the gardens allowed us to lose ourselves barley noticing the presence of the dozen or so other visitors. 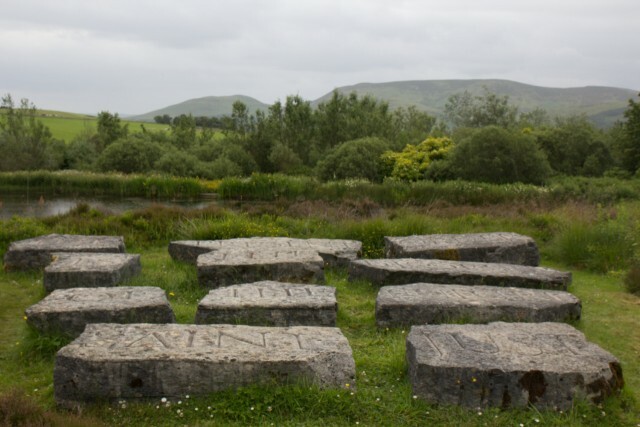 Finlay, who died in 2006 was a prolific artist and poet and the garden combines the two in his concrete poetry – literally, as the shapes and lines and the choice of different fonts and sizes, as well as the meaning of the words are carved into stone, not by him but by craftsmen collaborators. There are some 275 pieces around the garden. If that sounds a tad overwhelming the space absorbs them well and although it feels like an art gallery it also still feels like a garden. The artworks have several themes, amongst them the French Revolution, WWII, and pre-Socratic views of the nature of the world. The garden is divided into eleven elements including an allotment, a wild garden, a Roman garden and an area called The English Parkland. There are many striking inscriptions and sculptures, not least the one overlooking the lochan (small loch) set out on eleven large stones saying ‘The present order is the disorder of the future. Saint Just’. Equally dramatic is the stone byre converted into a temple to Apollo with Corinthian and Ionic columns painted onto the front with an inscription ‘To Apollo, his music, his missiles, his muses’ set in one of the more homely elements of the garden the temple pool garden, with a gorgeous lily pond in front of it. Wandering through the wild area by the lochan I came across all kinds of carved inscriptions such as ‘The world has been empty since the Romans. St Just’ (him again). True, but they never got as far as South Lanarkshire; the Antonine Wall is some way south. 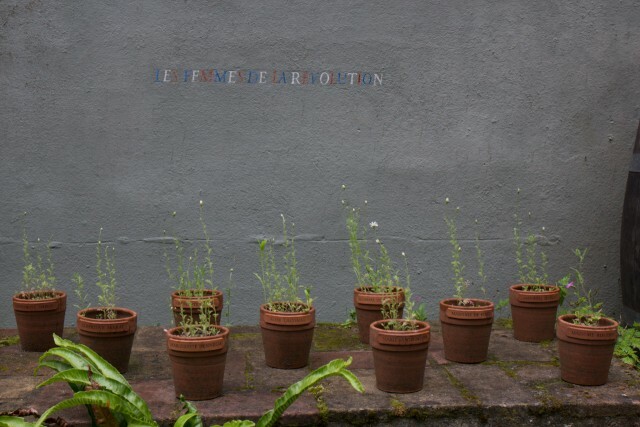 One of the most charming elements is the series of small flowerpots on a stone shelf, each one with the name of a female French revolutionary and on the wall of the house behind the caption ‘Les femmes de la Revolution’. The house isn’t lived in any more which is a pity and the whole place is quite low key – the lady taking the money sells a few postcards and pamphlets but trade was slow. 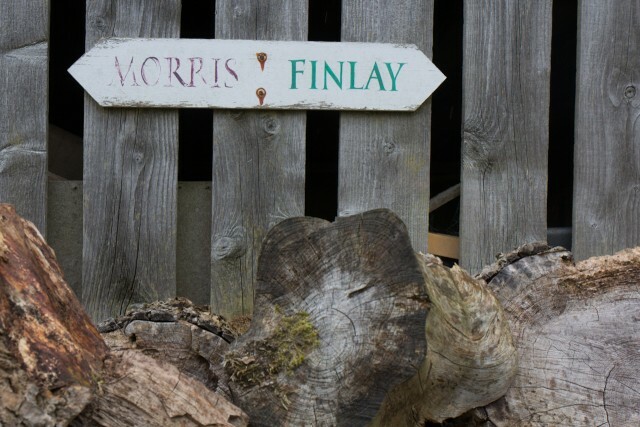 She did have time to answer my question about the little wooden sign round the back which didn’t look as if it had the mark of the great man about it, saying ‘Morris : Finlay’. Something to do with two great artists perhaps? No, it was to direct the heating oil delivery men to the correct tanks for this and a neighbouring households winter fuel supplies. The summer solstice passed a week ago, even Glastonbury is over, but this year’s elderflower is only just going over now. Its been a cool spring and early summer and there has been a particularly bountiful crop. 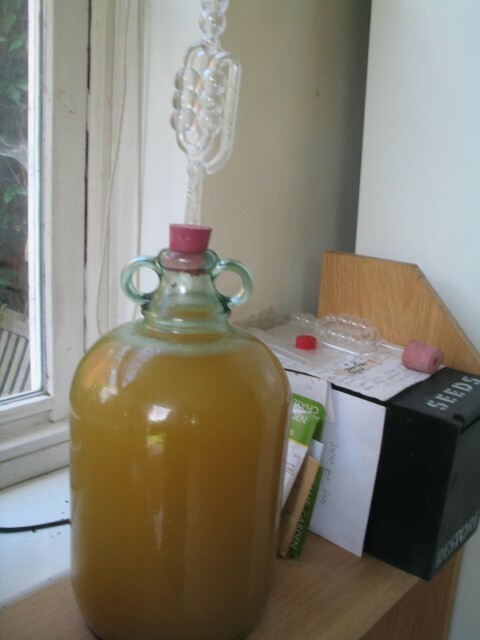 Now I have a demi-john of the stuff bubbling away in the kitchen, slightly to the amazement of visitors who mostly guess correctly that it is wine-in-the-making, but hardly ever guess that it is elderflower. Elderflower really is the queen of flower wines. The aroma when it is mashing is divine and fills the whole house, and the wine itself is one of the most refreshing and distinctive I know. Of course elderflower don’t have to be used to make wine – the cordial ain’t bad either. Actually I’ve branched into something new with them this year too – elderflower frittata. Picking the flowerlets before breakfast and then collecting the eggs (such willing hens….) what could be better. So good indeed that it has ended up as a recipe in my forthcoming book The Cowley Road Cookbook, where foraged ingredients play more than just a walk on part. But back to elderflower wine. After three days mashing, it take at least another month before the contents of the demi-john are fully fermented. Then its time to bottle. And after a few months, drink. My friends Jo and Eric reckon if you can keep some till after the flower burst the next year there is a particularly flowery aftertaste. I’m sure they are right. Its just I never seem to have any last that long! Spring has arrived and with it my Airbnb guests. I had my first ever visitors from Vietnam earlier this week, business student Phuong and her dad Son, visiting her from Saigon. 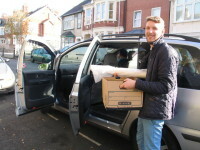 On arrival I mentioned to them that I needed to go out to my allotment shortly to tend to my vegetables. The comment produced an outpouring of enthusiasm. ‘How wonderful – could we come with you?’ This is definitely the first time guests have expressed such enthusiasm, mainly the questions are on the easiest way to get to Bicester Village or which colleges the Harry Potter films were shot in. But of course the tradition of home vegetable growing especially the much prized ‘private plots’ allowed under communism, have a strong resonance – especially as they constituted about 1% of the cultivated land but produced 25% of the food in many communist regimes. They were suitably delighted to discover how close the allotment was – they had assumed a lengthy bus ride rather than a five minute walk. On arrival Son and Phuong were clearly amazed at the lushness of it all, especially the range of flowers on some plots, which did look rather beautiful in the evening sun. An inspection of my plot followed – the source of greatest surprise being rhubarb, a totally new concept to them.The garlic came in for approval but I was stumped by their questions about ‘black garlic’ something I’ve never seen nor heard of. After a quick visit to my space in the shared poly tunnel where they admired the basil and tomatoes making great progress in a rather chilly May, the final stop was the orchard plot. This produced the strongest reaction. Cherries just netted against the birds, and apples and pear blossom just setting were viewed with reverence and delight. At last a bit of rain! So I was off to the orchard plot on my allotment to scythe the rapidly growing grass under the fruit trees. Some damp on the grass works a treat and my two handled scythe from Simon Fairley of Tinkers Bubble cuts through the new growth like a knife through butter in these conditions. But before I’d even reached the plot and commenced scything, two fellow allotmenteers had accosted me and made jokes about my resemblance to Aidan Turner (not) and his scything in ‘Poldark’. So controversial! Not everybody agreed with his style which certainly looked more like hacking at the grass than scything as I understand or practice it and debates have raged in media ranging from the ‘Daily Telegraph’ (see link) and Patrick Gore-Langton in the ‘Daily Express’ to the News Quiz. As for me.. well the scything was going just fine until the rain came down again with about a third done. So its the shirt-on Ross Poldark look-alike(ish) up on the plot again later in the week. China may be associated with large-scale, commercial agriculture, but on my trip there in 2014 I was delighted to discover that ‘Bio Farm’ in Shanghai is bucking that trend. 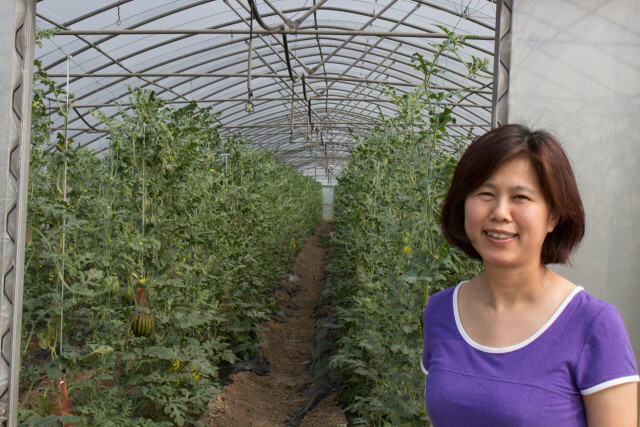 Founder Jane Tsao (pictured) set up this small farm in the eastern suburbs of the city in 2004, and it gained organic certification a year later. She now employs about 60 staff and together they grow a range of fruit and vegetables including salad crops, tomatoes, spinach, water melon, figs, strawberries and peaches. The farm manages to stay economically viable by selling its produce to high-end restaurants in Shanghai. This is combined with a community supported agriculture (CSA) scheme with approximately 400 subscribers. Bio Farm is linked to Garden Organic though the International Federation of Organic Agriculture Movements (IFOAM), and it uses a range of its educational materials. The team run a ‘grow your own’ education programme and a ‘Bio Farmers Kitchen’, where CSA members and farmers can prepare and cook their food. The day that I visited, its volunteers were preparing open up the farm for a ‘tomato day’ to encourage more visitors. Jane sees plenty of room for growth in the organic sector in China. “It’s a rather elite niche at the moment,” she says. “But we love and need reliable, safe food in China and we are proof it can work right here in Shanghai.” The biggest problem Bio farm faces is development pressure. This five-acre patch of greenery is right beside a main road and surrounded by factories, offices and suburban housing. Local developers are already arguing that the farm is an inefficient use of space. 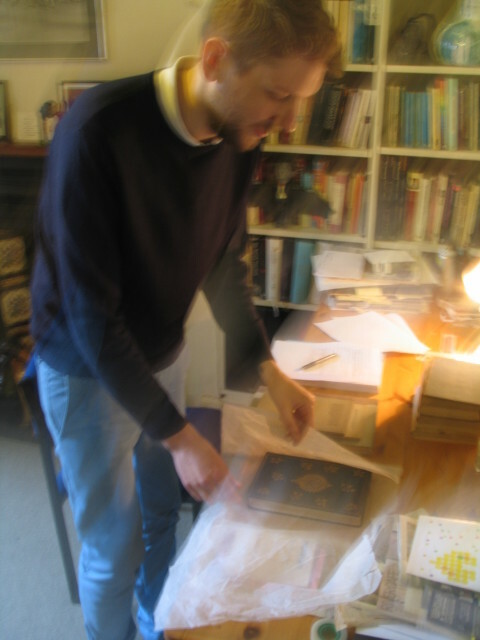 Jans Ondaatje Rolls ‘The Bloomsbury Cookbook’ (Thames and Hudson) is as much social history as cookbook. The ‘Bloomsberries’ may have been the foodies of their day, but were profoundly ignorant of all aspects of food production and preparation. The book combines food related paintings, prose and gossip, with recipes, to provide a very human portrait of this much studied Group. From a very different perspective and taking a much longer historical sweep, Margaret Willes in ‘The gardens of the British working class’ (Yale University Press) focuses more on the struggles of creating a ‘blessed plot’ from cottage gardens and allotments. She brings it to life through the words of people such as Joseph Turrill, small time market gardener and diarist who was a neighbour of Lady Ottoline Morrell in Garsington. A horticultural history of the people who latterly were employed as the cooks and gardeners to the intellectuals. This post first appeared as an article in The Guardian ‘readers books of the year 2014’, on 27 December 2014. It was so wet and gloomy that an afternoon invitation to see HRH Prince Charles open the new Heritage Seeds Kitchen Garden at Le Manoir aux Quats Saisons a few weeks ago was potentially something of a mixed blessing. In the event the mud won out and the guests were confined to quarters – or Quats as it seems to be known locally – the drawing room of the Le Manoir. His Maj toured with an excited Raymond Blanc (‘RB’ to the staff), Anne Keenan the garden designer, David Love Cameron the head gardener and of course Garden Organic’s CEO, James Campbell. Quite enough, once the security guys had done a once over to check for anything untoward, to turn the place into a fairly accurate replica of the Somme. Especially after the formal planting of an apple tree to commemorate the visit. It turned out to be an F1 hybrid – not very organic, so someone will have to slip out and buy a replacement when nobody important is looking. Much more salubrious chatting in front of the log fire to Garden Organic’s Vice President’s Susan Hampshire and Thelma Barlow (from Coronation Street) both of whom are real gardening experts and organic growing enthusiasts. Eventually the royal party pitched up, shaking the rain from the coats and umbrellas and joined us for tea. When having tea with royalty what to talk about? ‘Have you come far?’ No, that is what they supposedly ask us. Well we have corresponded about keeping chickens in the garden in the past – something which has led to Garden Organic’s Hens@home project (see my blog post of 8 April 2014) so I tried my luck. Bingo, the Royal face lit up and soon the conversation was not only about hen keeping but the merits of keeping a pig in the back garden as well. Great way to reduce food waste he assured me. Don’t tell DEFRA! Perhaps the ‘black spider’ already has. And what was the tea like you ask? What you got was great – how could it be otherwise at Le Manoir, but there was so little that I’m sure the hens, let alone any piggy waiting patiently outside for any scraps, died of starvation years ago. In one of those strange conjunctions of life, this morning I said goodbye to 18 books, pamphlets and letters by William Morris for Jeremy Deller’s (he of the ‘English Magic’ exhibition currently on in Margate) latest exhibition, on William Morris and Andy Warhol to open at Modern Art Oxford on 6 December and then received my annual load of muck from local farmer Paul, on the allotment. All muck and (English) Magic… sort of … in the space of an hour. 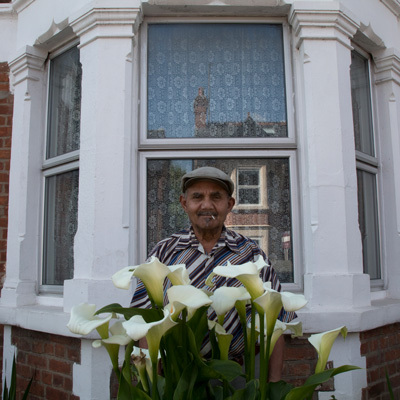 Researching my book on the social and cultural history of Oxford’s Cowley Road through food, is turning up some great stories. Not least that of the ‘Oxford sausage’. From medieval times on, Oxford was well placed in the centre of southern England as an agricultural centre. Animals were driven to the city from as far away as Bristol for slaughter and it became something of a meat processing centre. The Oxford sausage, made from a pork and veal recipe was invented in the 18C by a Mrs Dorothy Spreadbury. By the late 19C it had become very well known, not least by being popularised my Mrs Beeton in her book ‘Household management’ published in 1861 where she refers to it as her ‘ideal sausage’. The recipe doesn’t appear as the Oxford sausage in later editions, so I thought I would reclaim it for Oxford by reconstructing it. Mrs Beeton used veal in her recipe so I suggest that lamb be substituted. Traditionally it was considered to be a ‘breakfast sausage’ and is notably spicy. The recipe doesn’t need skins because of the of beef suet which stiffens it. Roll it in flour instead before frying. So here is the ‘modern version’ ie without veal. Chop the pork, lamb and suet finely together. Add the breadcrumbs and lemon peel and a grating of nutmeg. Wash and chop the sage leaves finely add these with the remaining ingredients to the sausage mix and when thoroughly mixed roll into sausages, cut to desired lengths and roll in flour. Fry with other breakfast fare such as tomatoes, mushrooms and eggs, as desired. By the end of the 19C century this humble breakfast sausage had been transformed into the ‘Royal Oxford sausage’. The Piggott’s sausage factory where they were made and its associated abattoir were established in the 1880’s in Denmark St, off Cowley Road and local photographer and early Oxford publicist, Henry Taunt retells of an Oxford Alderman giving evidence to a parliamentary Committee who made reference to ‘Oxford manufacturers’. It seems that local people were less forgiving and regularly complained of the smell, but the factory and abattoir remained open until 1937. I don’t think I have perched a glass of champagne on a compost bin before. But I did today on a visit to the organic vegetable garden at Le Manoir aux Quat’ Saisons at Great Milton outside Oxford. 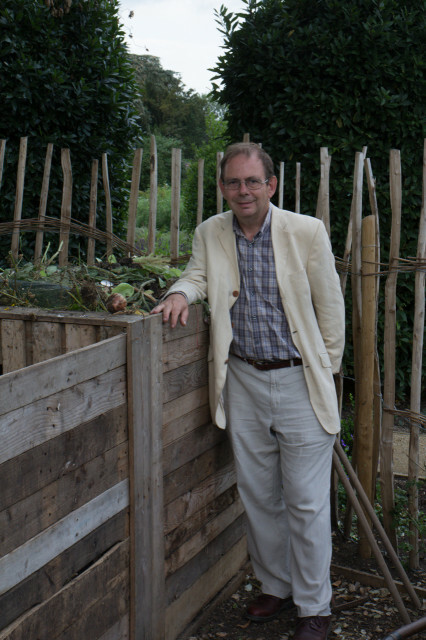 The occasion was a tour of the vegetable gardens led by their star gardener David Love Cameron (who spoke at the Garden Organic AGM in May) and garden designer Anne Keenan, for a group of Garden Organic’s major donors and Trustees. It was a warm September afternoon, ideal for a garden tour – a fact that I noticed as I cycled out from Oxford, hoping to do the trip in 45 minutes and finding it took 55, including getting lost in Great Milton. Unfortunately I’m not such a regular visitor to Le Manoir that I could find my way unerringly and needed directions from three young people sitting on a bench on the village green. 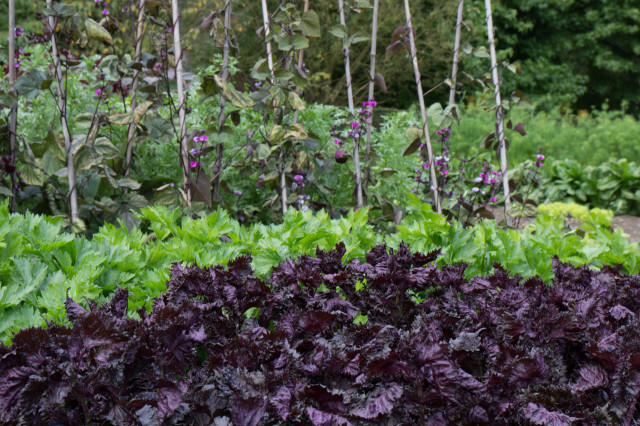 What fun it was as we were shown the vegetables, the poly tunnels and greenhouses, the areas planted up for the dinner table and those mainly planted up for visitors to look at, to demonstrate the success of an organic kitchen garden in action. 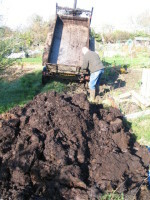 Quinoa, amaranth, chard, pumpkins and squashes, beans, the herbs, tomatoes, peppers, chillies, a huge range of Japanese salad crops, and much more besides, including of course the composting systems… leaf mould, wormery, bin system. The garden has it quirks. There isn’t much in the way of flowers as companion planting, a fact remarked upon by some of our party. Over tea and that champagne, one of the gardeners explained that ‘Mr Blanc is a bit of a purist. He doesn’t like flowers in the vegetable garden…’. Yes there are signs of Mr Blanc’s unique stamp all over it. Admiring the large pond by the main house with lilies and bird sculptures, something that has been there since the 15c to raise fish in, one of the gardeners explained that crayfish were introduced not so long ago… by Mr Blanc himself. Unfortunately they were the wrong sort, not the innocent English variety but the far more aggressive American species. An accident, and one with consequences. They rapidly burrowed through the pond lining and into the stone walls. The pond drained away alarmingly and an urgent cull was launched. Nearly all have been caught and no doubt served with a great flourish in the nearby dining room, but a few remain. Thank goodness it a French man and not a member of staff, who mistook American for British.